Ben Gold, Gareth Emery en Ashley Wallbridge, wat een feest, super complimenten aan Armada!! 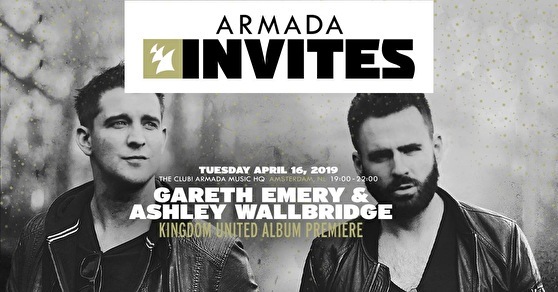 'Kingdom United', the very first collaborative album of Gareth Emery & Ashley Wallbridge, is soon to arrive, and we aim to celebrate this wonderful moment in style. On April 16, we're welcoming the U.K. electronic music heroes to our own in-office club for a brand-new, blistering edition of 'Armada Invites', and you can be there! Do you want to attend ‘Armada Invites Gareth Emery & Ashley Wallbridge at Armada Music HQ in Amsterdam from 19.00 - 22.00 (CEST)? Sign up below for a chance to receive two tickets for this exclusive party! Please note this is a 18+ event.